That sound you hear along 42nd Street isn’t just falling leaves and zipping coats, it’s the autumnal whoosh of Broadway diving into its fall season. After a quiet summer marked only by the long-delayed opening of Spider-Man and revivals of Master Class and a star-studded Follies, October rushes forward with four Broadway openings and several other productions starting previews. Arguably the most anticipated show this month is Katori Hall’s drama, The Mountaintop, which imagines a conversation between Martin Luther King, Jr. and a hotel maid the night before the reverend was assassinated in Memphis. Samuel L. Jackson and Angela Bassett co-star in this two-hander, which won the 2010 Olivier Award for Best Play after its premiere in a tiny London theater followed by a move to the West End. Kenny Leon, who staged 2010’s marvelous Fences revival, directs The Mountaintop, which opens Oct. 13 at the Bernard B. Jacobs Theatre. Comedy aficionados will be anxious to see Honeymoon Motel, a new one-act play by Woody Allen that is part of Relatively Speaking, a trio of shorts opening Oct. 20 at the Brooks Atkinson Theatre. John Turturro directs the evening, which also includes Talking Cure by film-meister Ethan Coen and George is Dead by the unstoppable Elaine May. True theater fans will also want to mark the 100th anniversary of unjustly neglected playwright Terence Rattigan, best known for The Winslow Boy, The Browning Version and Separate Tables. What better way to honor this subtle craftsman than by catching Man and Boy when it opens Oct. 9 at the Roundabout’s American Airlines Theatre – especially since it stars Frank Langella as ruthlessly amoral businessman Gregor Antonescu? Promised, as well, for October is another revival of Edward Albee’s masterpiece, Who’s Afraid of Virginia Woolf?, this one a transfer from Chicago’s estimable Steppenwolf Theatre Company. Tracy Letts, Pulitzer-winning author of August: Osage County, stars as George opposite fellow Steppenwolf veteran Amy Morton’s Martha. A theater has yet to be announced at press time, but the 1962 classic is scheduled to open Oct. 13. 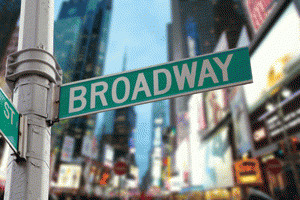 As for the rest of the Broadway autumn, promised are a new Godspell, a Bonnie & Clyde musical, a modernized musical Lysistrata, a Broadway transfer for the off-Broadway hits Other Desert Cities and Venus in Fur, and new plays by David Henry Hwang and Theresa Rebeck. Whoosh, indeed.